Anne Haack is an intuitive coach & holistic healer, Reiki Master, yoga and meditation teacher, movement facilitator and DJ. Having followed the path of yoga and healing for more than 17 years in India, Morocco and Europe and through life changing transformations she was lead to work with the tantrik system of the chakras and kundalini energy. Anne uses creative meditation techniques, rituals, ceremony, bodywork and movement to help people deeply transform, shed old skin and create a bridge between the inner and outer Self. 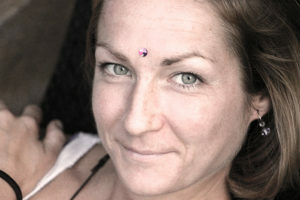 She leads Cacao Ceremonies for women, chakra workshops, retreats and TTCs, as well as dance events. Anne is the founder of *Mala Magic*, healing Malas and crystal bracelets, JUST DANCE, a spiritual dance journey in Rishikesh, and Goddess Initiation, an Online Course for women to open up to all aspects of the Divine Feminine in body, mind and spirit.